Puppy Class is Great for Socialization! Your puppy goes through a socialization period from around 4 weeks to 20 weeks that permanently shapes his/her future personality and how s/he will react to and handle things in the environment as an adult dog. It is the most critical time of your dog's life. Gently exposing your dog to a wide variety of people, places, and situations in a way that is fun for the dog makes a huge and permanent difference on how his/her life will be in the future. Gentle handling of puppies at 3 weeks of age starts the process. 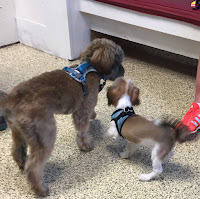 Socialization means you will be helping your puppy become acclimated to all types of sights, sounds, and smells in a safe and positive manner. Proper socialization will prevent a dog from being always fearful of children, riding in a car, going to the vet, being around other dogs, etc. Puppies should be exposed, in a positive or neutral way, to as many things as possible. No fear allowed! Negative experiences that occur during this critical socialisation window can affect your puppy for life. Your puppy needs to be exposed to things several times over the socialisation period - once won't do the trick, you need to have multiple exposures. Socialization will help him/her develop into a well-mannered, happy canine companion. Having a dog who is well-adjusted and confident can go so far as to save his/her life one day.For additional information and more free advice, click here.